It's that glorious time of year when pumpkin-filled recipes abound. Since homemade pumpkin puree is a much healthier, tastier, and more affordable alternative to canned or boxed pumpkin, we're offering this tutorial on how to make your own pumpkin puree from scratch for all your recipe needs. To date, BPA-free canned pumpkin has been impossible to find, and boxed pumpkin can be quite expensive. Homemade pumpkin puree is super easy to make and you don't need expensive equipment to get the job done. All you need is a blender, babyfood maker, or food processor to grind the pumpkin flesh. 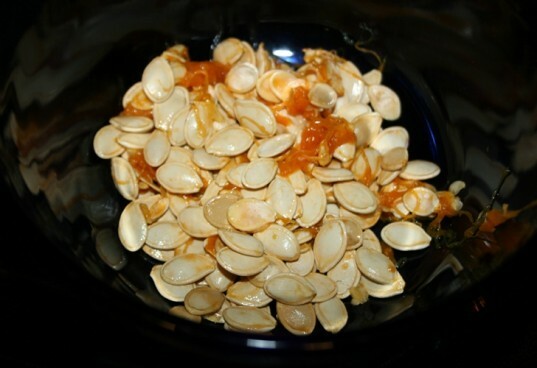 You can use the pumpkin puree to make any recipe that calls for pumpkin and even for babyfood. Keep reading to learn how to make your own pumpkin puree and find a printable one-page recipe here. Preheat oven to 350. 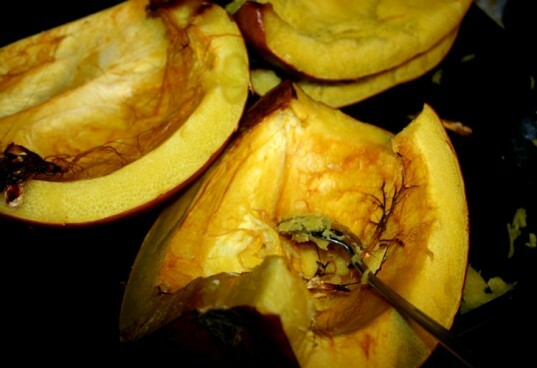 Cut the top off of a 10-pound organic pumpkin, and remove all of the seeds. Try not to take much flesh out of the pumpkin. Save the seeds for baking or art projects. 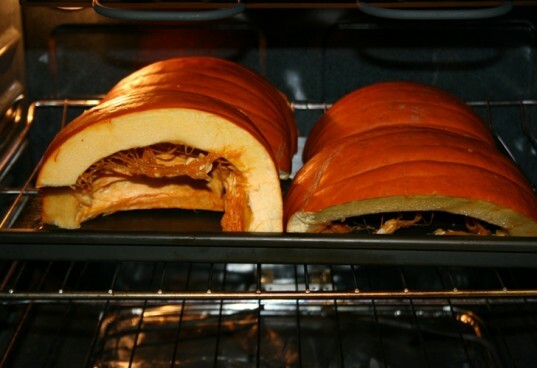 Depending on your baking sheet size, cut your pumpkin into 1/4 pieces. If you have a smaller sheet, cut into smaller pieces. Lay your pumpkin pieces flesh down on a baking sheet. Cook at 350 for 30-45 minutes. You want the flesh to be tender. Let the pumpkin cool 15-20 minutes before handling. Then, using a spoon, scrape the flesh out of the pumpkin slices and set aside. 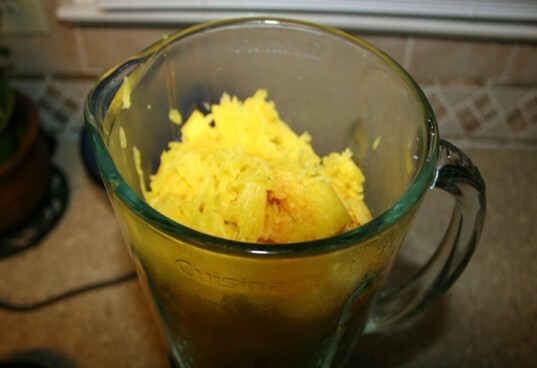 Using a blender, food processor, or baby food maker, puree the pumpkin until smooth. Then jar/can the pumpkin puree. Store in the fridge for 10 days and freeze for up to 3 months. 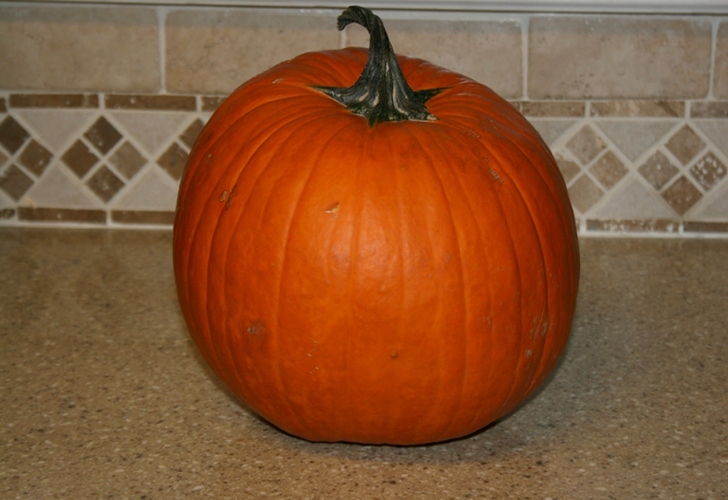 Cut the top off of a 10-pound organic pumpkin and remove all of the seeds. Try not to take much flesh out of the pumpkin. Save the seeds for baking or art projects. Depending on your baking sheet size, cut your pumpkin into 1/4 pieces. If you have a smaller sheet, cut into smaller pieces. Lay your pumpkin pieces flesh down on a baking sheet. Cook at 350 for 30-45 minutes. You want the flesh to be tender. Let the pumpkin cool 15-20 minutes before handling. 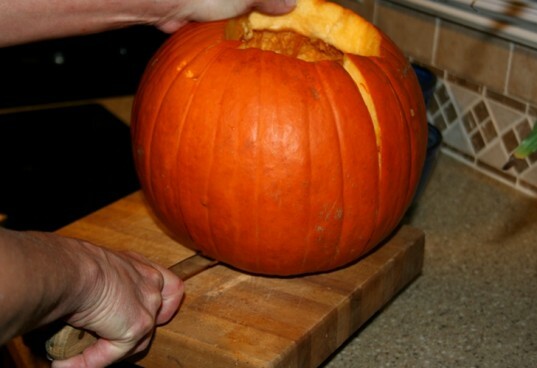 Then, using a spoon, scrape the flesh out of the pumpkin slices and set aside. 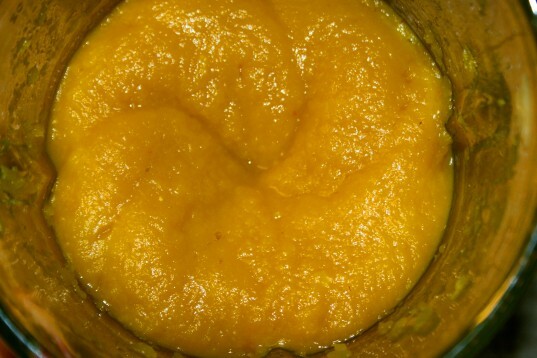 Using a blender, food processor, or baby food maker, puree the pumpkin until smooth. Then jar/can the pumpkin puree. Store in the fridge for 10 days and freeze for up to 3 months.